If you’re looking for an orthodontist in Forth Worth to find out if you’re a good candidate for Invisalign clear aligners, you should know that our orthodontist, Dr. Sheila Birth holds the distinction of being a 2016 Invisalign Top 1% Provider. Having treated scores of Invisalign patients with outstanding results, Invisalign has recognized Dr. Birth for her expertise and exceptional achievements. By choosing Orthodontics by Birth, Stewart & Fletcher, you get the assurance of knowing that you are in the most experienced and capable hands. What Is a Top 1% Provider? Many people do not realize that every Invisalign provider is not the same. While every orthodontist & dentist that offers this innovative treatment is trained by Invisalign to become a certified provider, there are different doctor designations based on overall experience and success with treating patients with Invisalign. The six provider designations Invisalign uses includes Teen Provider, General Provider, Premier Provider, Preferred Provider, Elite Provider and Top 1%. 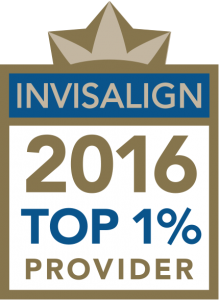 Being recognized as a Top 1% Provider of Invisalign is a significant achievement as very few orthodontists qualify. The 1% designation places the orthodontist earning this achievement in the top 1% of all orthodontists in the world who offer Invisalign, which we’re confident you’ll agree is quite impressive! When you choose an Invisalign Top 1% Provider as your orthodontist, you will receive the absolute best, customized orthodontic treatment possible to ensure you get amazing results. Just as you wouldn’t trust just any doctor to perform a delicate surgical operation on you or a loved one, you should not trust your smile to just any orthodontist. When your treating orthodontist is an Invisalign Top Provider, you can be confident in the fact that your orthodontist has the necessary skill, expertise and experience to improve and optimize your smile using Invisalign clear aligners. Your fully customized treatment plan will be carefully planned out, step by step, using advanced 3D imaging technology to ensure that the Invisalign aligners made just for you move your teeth into the correct positions to result in a straight and healthy smile. If you are interested in finding out if you are a good candidate for Invisalign, please contact us today to schedule your free consultation. After we provide you with a thorough, careful examination, we will discuss your treatment options with you to help you choose the right treatment method that best meets all your needs. We look forward to seeing you soon!